Made these for a karaoke snack at Jo-En's place. Initially wanted to do stuffed cherry tomatoes but then the girls would prefer chicken - so decided to make this snack instead. Pretty simple to make and kid friendly. You'll only get a hint of wasabi. Instead of breadcrumbs, I decided to use polenta as the crust. It has this grainy crispiness that you don't have with breadcrumbs. 500g chicken breasts, cut into strips. Marinate these for around 30 minutes. 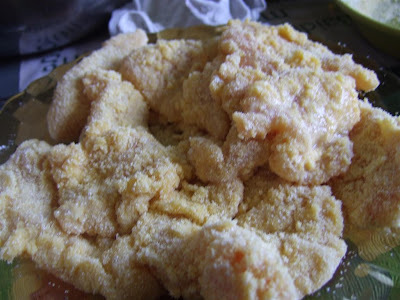 1) Coat chicken strip on the corn flour then shake off the remove excess flour. 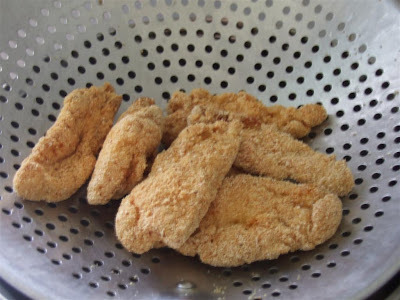 4) Put aside on a plate and repeat with the rest of the chicken strips. 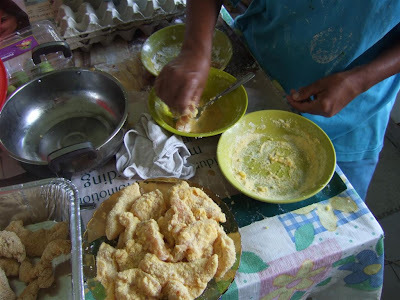 5) Deep fry them until slightly golden in colour. 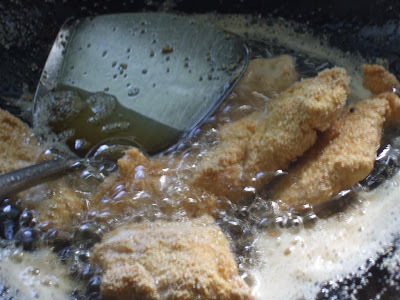 Note: You must fry them in batches so the temperature of the oil won't drop too much. Don't chuck them all in at once. 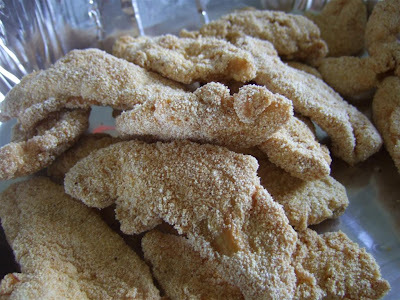 What I did is to deep fry the first batch, and continue coating the rest, while keeping watch on the ones that are being deep fried. I got someone to help me coat while I deep fry - so it's easier to manage. Serve with sweet chili sauce or you can make a wasabi mayonnaise dip. Just mix 2 tsp of wasabi powder with a cup of Japanese Mayonnaise. polenta is basically cornmeal. Can find in supersave.